Cornrows are a great style for men or women. Cornrows are a relatively popular and low maintenance hairstyle. They are also relatively easy to do, and with just a few supplies, you'll have a new hairdo in no time. Moisturize hair using a light hair cream or serum. Distribute evenly throughout hair. Comb through with a wide-tooth comb. Section off a portion of your hair to be braided. Secure the remaining hair in a ponytail holder. 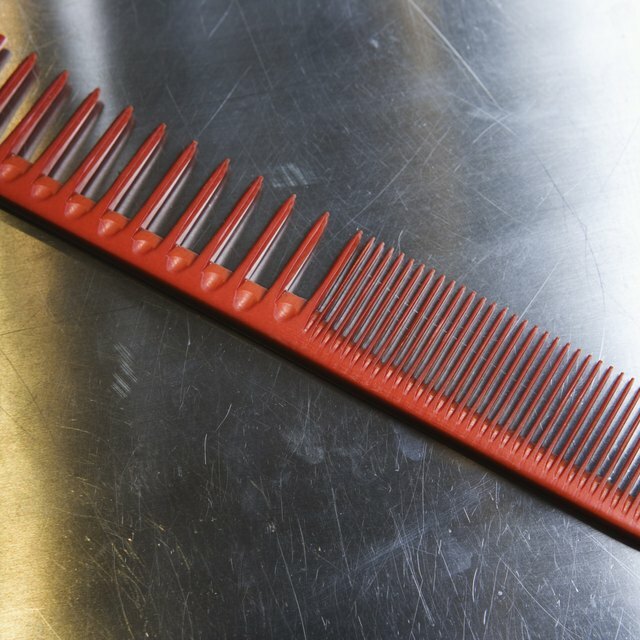 Draw a line, or part, using the tail end of your rat-tail comb. The part should be straight, separating one section of your hair from the rest of the hair. Draw the part straight from the front of your hairline back to the nape of your neck. Make sure the part is straight. Braid the portion of hair you just sectioned off. Continue to part and cornrow the hair. Repeat until hair is completely braided. The finer the hair texture, the tougher it will be to keep the hair away from the part. Finer hair is also more difficult to grab when braiding, as it may slip out of your hands more easily. Sonie Guseh began writing professionally in 2006. She has written on subjects ranging from politics to fashion, and has worked with WTVD/ABC11, "Metro" newspaper and "two.one.five magazine." Guseh received her Bachelor of Arts in English with a concentration in journalism and print culture from the University of Pennsylvania.